What questions would you like to ask an aircraft sales specialist? Selecting someone to guide you through an aircraft sale or purchase is an important decision. Before you select the right aircraft sales specialist, you probably will ask several questions and evaluate the answers. A reporter recently asked Brad these questions for an article. We thought they were good ones, so we’ll start with these. Question – How do customers in different countries have different expectations, or negotiate differently? Brad Harris – This is a casual transaction for the American customer, who is often referred by another customer. We find that Americans use the Internet and the news media, and are quite astute about the aircraft before they call us. It’s a very relationship driven transaction from that point forward. We spend as much time as needed educating the customer. When we look at the culture in the Middle East, Asia and Europe, all of those cultures are different. An excellent broker will understand those cultures. As an example, we have a particular customer in the Middle East who doesn’t want to sign a document guaranteeing exclusive representation, but they give us their word that they will use us and they do. It’s all about trust, time, and referrals from other clients. Question – How long does it take to buy or sell and airplane? Brad Harris – Every client has a different situation. Every client has an ideal timeframe that suits his or her financial picture, business transportation needs, geography requirements, dependency on the sale of another aircraft, price requirements, flexibility, and so on. One person might need an aircraft immediately; in that situation we would shop for a retail aircraft. The objective is to buy the best aircraft at the best price you can find that’s on the market now. That transaction usually includes one week of negotiations, one week for the pre-buy phase when we fix any discrepancies, and then we close in the third week. That said, we just closed a G-IV transaction within one week from start to finish, when we simply reviewed an inspection that had already been done. The longest transactions usually happen when a client has very particular requirements in terms of price or a particular aircraft. It could take several months to identify the ideal aircraft, and then several months again to wait for the right price opportunity. Question – What are the most common problem that occurs in the transaction process? Brad Harris – The most common problem is incorrect pricing. The market intelligence for price is very well defined. Of course we reference the Aircraft Bluebook and the VREF values but we also create a complete market summary with transactions over the last six to twelve months. With that information, we can price an aircraft very well. But if someone doesn’t have good representation; they might get ideas from friends or pilots or other brokers that aren’t factual and well-researched. They might overbuy, or buy something cheap. A buyer might not understand what’s hidden behind a low price – damage history, missing records, a big inspection coming due, engines coming due. So it comes down to experience and knowledge and someone you can trust to represent you so that you don’t get caught with those gremlins. Question – Is it stressful to be in the aircraft sales business? Brad Harris – The typical aircraft sales representative has a very good life. It’s a very small community and we all tend to know each other and get along fairly well. I will tell you that it can be stressful at times. We have a passion for aviation and long-lasting relationships with our customers and clients, and our strongest suit is that we are problem solvers. To do that, you have to have quality people that are willing to put in the extra hours and the extra travel. We manage the entire transaction process from start to finish, so we have Dallas Jet employees on site for every inspection and for every test flight. We review the data, we understand the airplane, oversee the prebuy inspection, so of course there is a lot of travel. It is very helpful when a sales rep has a very supportive family that understands what you do and how you do it. That really helps manage the stress. In the end it’s a great lifestyle and a great group of people. Question – How do you handle a customer whose heart is set on an unsuitable aircraft? Brad Harris – About twenty to thirty percent of the time, clients come to us with an aircraft in mind. Part of our process is to define the need. We must know the requirements for that particular customer. What range are they flying? How long are they staying, so how much baggage space do they need? Are they operating in high and hot environments, mountainous terrain, or overseas? Once you put those requirements together, you can present the best aircraft for them. Even if they’ve come in with ideas from people they’ve talked with on the golf course or other casual business setting, we find that ninety nine percent of the time, they will listen to what we have to say. But it’s ultimately their decision and we will help them buy the aircraft that they decide on. Question – Do buyers always expect a test flight, and how do you assess their seriousness? Brad Harris – Buyers always expect (and should expect) a test flight. We typically arrange for the test flight to be from the home base of the aircraft to the maintenance facility where they’re going to complete the prebuy inspection. We will not provide a test flight without a letter of intent or formal purchase agreement executed, with a refundable deposit in escrow. What that means is that if they reject the aircraft after the test flight, the buyer will pay for those costs. Shawn Dinning, Dallas Jet International’s Managing Director of Sales discusses his background and approach to aircraft sales. As Brad Harris noted in his article, the primary asset Dallas Jet International brings to bear in an aircraft transaction is the experience and expertise of the professionals assigned to our clients’ aircraft sales transactions. So, this article will delve into the background and motivations of that other professional – namely, me. 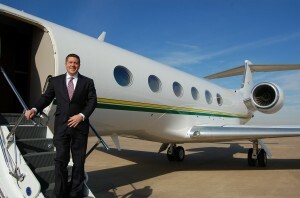 My position at Dallas Jet International is Managing Director of Aircraft Sales and Acquisitions. Aircraft transactions are my domain, and I manage the aircraft purchase and sale process comprehensively for my clients from beginning to end. Usually, when a client begins the aircraft transaction process, we will assign the project to Brad or myself, usually (but not always) based on who has the relationship with the client. In some cases, there may be an aircraft transaction involving an aircraft with which one of us has significant expertise that would be useful in getting the best outcome for our client. From that point on, that “project manager” will lead the transaction through completion. There are times when Brad and I feel that we can effect the best outcome for a particular client’s situation by working together. The rest of our company team supports the transaction process. Dallas Jets International provides the very best aircraft transaction experience in the world, bar none, because our system is so comprehensive and holistic. As an example, one of my clients called me last month to tell me that he bought a yacht and a high-end auction car at the end of the year. He said the buying process was horrendous compared to his last aircraft purchase experience with Dallas Jet as his acquisition agent, and for equipment that was not nearly as complex or expensive as the aircraft he had purchased. Maybe he will become our first client if DJI decides to get into the yacht brokerage business! I didn’t always want to be an aircraft transaction specialist and consultant. My entrance into aviation came from my goal to be a fighter pilot in the US military. And that, really, came from my exposure to many of my parents’ pilot friends who had flown in the US military. I am the son of an airline captain and flight attendant. Obviously, my immediate family was steeped into the aviation tradition, and that’s how I caught the bug. I figured out that the best chance I had to get into the cockpit of an F-15 in the Air Force was to apply to the United States Air Force Academy in Colorado Springs, Colorado. Everybody told me I was crazy because they only accepted people who had 1600 SAT scores and who were in the Boy Scouts since birth, neither of which described my credentials. Nevertheless, I applied through the recommended channels for a Congressional Nomination and for an Appointment to the Air Force Academy and the Naval Academy at Annapolis. The Naval Academy was my backup, and I would have gone there in a heartbeat. I received the letter confirming my congressional nomination from the U.S. House of Representatives and the letter confirming my appointment to the Air Force Academy within 1 day of each other. The appointment letter arrived on Christmas Eve! In a bad stroke of luck, a medical ruling during my Junior Year (3rd year) at the Academy derailed me from pilot training. In one 30 minute doctor’s visit, things changed dramatically for me. Fast forward several years and economic cycles later, I pursued my dream to fly via the civilian world. About 5000 hours into my flying career, I had the pleasure and fortune of meeting Mr. Brad Harris (CEO of Dallas Jet International) at a private airport in Fort Worth. It was a random encounter, and nobody introduced us. We just started to talk. He invited me to go sit with him in one of his client’s airplanes, as he told me about the business that he was running. It sounded like a match made in heaven for me. For the next 8 months, I followed up with more emails and phone calls than Brad knew what to do with. He finally offered me a position to learn and eventually oversee the day-to-day transaction operation at Dallas Jet International. He said that my academic, military, business, and flying backgrounds would be a perfect fit for the company’s vision of hiring the best people in the business and growing the list of satisfied airplane owners and clients. Brad Harris has been one of the best mentors I could ask for, and has groomed me to contribute significantly to the success that our company currently enjoys. In its purest form, an aircraft broker and transaction consultant is all about obtaining the highest price in the minimum time for a selling client, and getting the best airplane for the best price for a buying client. If we didn’t save a lot of money and heartache for our clients, we wouldn’t be in business. And to be clear, we save our clients a lot of money and many hundreds of hours of wasted effort. And, as much as I love saving other people’s money, I value the relationships more than anything. Make no mistake that trust and relationships are at the heart of any successful aviation brokerage firm. Trust is the number one reason I am hired to represent a client in his multi-million dollar aircraft transaction. I wouldn’t want it any other way. It is important to know that I truly get to represent the interests of the airplane buyer, and I don’t have to promote a bias toward a particular manufacturer or type of aircraft. This is such a key aspect of the value that Dallas Jet brings to the aircraft transaction process. So many people think that we represent a certain line of airplanes, or that we collect referral fees from sellers who want us to push an airplane on our buying clients. Of course this doesn’t happen at Dallas Jet, but it has been known to happen in this very unregulated business in which we compete. Every buying client’s situation is different, and it is my job to gain a very detailed understanding of the client’s needs before I recommend the type and serial number of airplane to pursue. No client or transaction is the same, and I absolutely love that! I’ve placed clients into Gulfstream, Bombardier Lear/Challenger/Global, Dassault Falcon, Cessna Citation, Hawker Beechcraft, Embraer, Pilatus, and Piaggio aircraft. It all depends on the client’s particular requirements and mission, and it is really crucial for me to have the freedom to make the best recommendation for that situation. Representing sellers is much more challenging in this market, but nonetheless enjoyable. I particularly enjoy the opportunity to get to know that particular airplane and its attributes so well that I can represent the airplane as though I had been the owner for the last several years. With this knowledge, I can represent the aircraft in its best light, because every airplane really is unique. It is my job to spend several days with the aircraft to learn who maintained it, what post-delivery modifications have been done, the status of maintenance inspections, and what options that set it apart from other competing aircraft on the market. In many cases, I already know the airplane very well because I have represented it in previous transactions. In some cases, I’ve even flown the aircraft. Next, I get to know all of the competing airplanes of the same make/model that are also on the market. And, I have to be able to explain the reasons why a prospective buyer should buy one type of airplane over the other, because buyers these days always seem to be considering multiple types of aircraft. This is where our hands on knowledge of the various airplanes available pays dividends. Between Brad and I, we’ve flown/managed/operated most of the business aircraft out there. We have 12 jet type ratings and 14,000 hours between the two of us. It is essential to know the pros/cons of every aircraft out there, without bias. The number one mistake that sellers make in today’s market is either overpricing or underpricing their aircraft. Both mistakes can cost an airplane owner hundreds of thousands, if not millions, of dollars in lost sales proceeds or in extended holding costs. The number one reason airplanes are incorrectly priced is either consultation with an inexperienced broker, or no broker consultation at all. Our market research process at DJI provides our customers with the confidence they need to price the airplane to sell, with no money “left behind on the table.” Secondly, the selling process can expose an aircraft owner to so much un-needed risk, and it is my job to protect and even “shepherd” my clients through that process, so that they are not taken advantage of. Protecting my clients’ interest throughout the selling process and making it smoother than my client expected is certainly the most rewarding part of selling the aircraft. My advice for prospective aircraft sellers and buyers? Hire a good broker! Better yet, hire DJI! As we all know, information is king in the 21st century. The speed and availability of information has certainly transformed the world of aircraft transactions. The internet revolution is the main contributor, and has made non-detailed market information available to the aircraft end user. As we say in the business, it’s just enough information for the aircraft end user to be dangerous and really make a poor decision One of the enormous emphasis points at Dallas Jet International is to stay ahead of the flow of information. If you fall behind the leading edge of current market information, you lose significant negotiating power, and your clients lose on buying and selling opportunities. We never let that happen at DJI. Our clients are the best-informed in the business. We are constantly developing techniques and systems to deliver information to our clients faster than the internet or our fiercest competitors. And, despite all of the technology and information flow, buying and selling airplanes has become more complicated, particularly with a growing number of international buyers/sellers and various governing bodies throughout the world, all of which have something to say about buying and selling airplanes. Technology is accelerating faster than ever. However, it still takes old-fashioned values of attention to detail, valuable professional relationships, attentive customer service, and unparalleled expertise to move airplanes in today’s dynamic business environment. You are currently browsing the Aircraft Sales Insights blog archives for February, 2011.